The following is the full text of his address. I am extremely pleased and proud to be invited here to remember the events at Kilmichael. Events that shaped the history of our nation. On this day 90 years ago, 36 courageous IRA Volunteers lay concealed in these surrounding ditches and drumlins. Waiting. Lead by brave Tom Barry, the column had assembled in Enniskeane late the night before. They left at 3.00 a.m. and marched through driving rain and the bitter cold. Each Volunteer lay hidden, alone. Waiting silently in freezing conditions for a well armed convoy of British Auxiliaries. No-one was allowed to break cover, for fear of compromising the ambush plan. The men’s clothes were soaked through. It was so cold that ice formed on their greatcoats and caps. And still they waited in silence. Most of the Volunteers present had little or no experience of guerrilla warfare and no formal military training. By contrast, the British forces were professionally armed and trained. The Rising of 1916 had been suppressed; its leaders executed and volunteers imprisoned. The British occupied the country. The wealth and people were exported. The great and the good told the people, ‘there was no other way’. But the IRA freedom fighters who gathered at Kilmichael were not deterred by any of that. They were not motivated by personal gain. They were not in awe of the great and the good. What sustained them that cold, wet, silent night was the same thing that sustained Bobby Sands 60 years later in a prison cell when he wrote. They knew the occupation of our country and denial of Irish sovereignty was wrong. They knew a better way was possible and they acted in the only way open to them. They waged armed struggle against British rule. 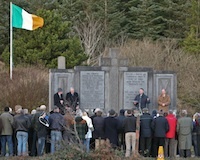 It is a deep honour for me today to speak at this monument, and join with you all in commemorating Kilmichael. West Cork has a proud republican tradition. I congratulate the great work of the Kilmichael Committee in commemorating and celebrating the example of these, our Volunteers, each year. Some of you are family of the Volunteers who fought at this ambush site; others are direct relations of the 3 Volunteers killed in action that afternoon - Jim O’Sullivan, Michael McCarthy, and young Pat Deasy. I believe it is fitting that patriotic and nationally minded citizens of diverse political allegiances continue to gather here 90 years on to honour these Volunteers. The Kilmichael ambush was a pivotal event in that period of our history. It changed the direction of the Tan War in West Cork and ultimately across the island. All my adult life I have taken inspiration from the self-sacrifice, and dedication of the Volunteers who fought here, at Crossbarry and in many other places during the Tan War. Every time someone tells me, ‘that no more progress can be made’, or ‘we have to accept our lot.’ I look back to the selfless courage of those who went before. And I resolve to carry on. All through the 1970’s, 80’s, 90’s IRA Volunteers continued to wage armed struggle to achieve a united Ireland. Their efforts brought about the Irish peace process and negotiations. Because of all that, peaceful and democratic strategies now exist to secure national and democratic objectives. The IRA said itself in 2005, that the best way to achieve Irish unity in present day Ireland was through political and democratic programmes; and to work with others to build increased popular support towards that end. During the many negotiations in the peace process, we were told that the British Army would always be on the streets and on our hill sides, that prisoners’ would remain in gaol, that the RUC would always be with us, that there would be no all Ireland dimension and that the unionists would never share power. Every time we were told, this far and no further, we drew on the experience of all of those that went before. The society we lived in was wrong and what we wanted was reasonable. We were right. And the people supported us. And because of that support I am now in a power sharing government linked to all Ireland institutions alongside four other Irish Republican Ministers. My elected role in the North is to represent all of our people, republican, unionist and nationalist alike, on the basis of equality and democracy. I do so as a dedicated Irish republican, committed to peace and the opening of new friendships and pathways towards Irish unity. I am motivated every day in my work by the vision of a free and independent 32 county Irish Republic, and an Ireland of equals. The foundation documents of modern Irish republicanism upon which that vision is based, are timeless. The Easter Proclamation and Democratic Programme of the 1st Dail, affirm the core values of Irish republicanism - of sovereignty, equality, citizenship and democracy. These values are not abstract. They are practical political objectives. They are also a guide to political action; but more, they set out a template for the type of Ireland our citizens deserve. Never before in the history of this state has the relevance of these political values been more urgent or immediate. The imposition of partition prevented the strategic economic, industrial and infrastructural development of our country. It was a denial of national democracy. And it institutionalised discrimination and inequality against nationalists in the 6 counties. The coexistence of separate economic and fiscal systems undermined our economic sovereignty and the potential for creating sustainable growth and prosperity. As a result Ireland’s national resources and labour have never been maximised for the benefit of our people. Today our country, North and South, is in the grip of a deep economic recession and financial crisis. The British Tory Government is trying to force a savage programme of cutbacks into the North’s economy. Sinn Fein will oppose these cuts and stand up for communities, as we always have done. In this state, half a million citizens are unemployed and emigration has returned to the levels of the 1980’s. Homes belonging to ordinary people, small businesses and farms, family incomes, the minimum wage, and welfare benefits are all threatened by the crisis and government budget here in the south. The economy has been driven into rack and ruin because it was allowed to, primarily serve the interests of greedy developers and bankers. And, yes, it could have been different. There is wealth in the Northern and Southern economies. But that wealth has not been used to address the crisis with strategies to stabilise our economies, and chart a path back to recovery. Instead, our people have been mesmerised with the language of confusion. There is much talk of bond markets, bail-outs and more. But this crisis is not about the bond holders or the bankers’ bail-outs. It is about bread and butter realities. Political parties need to remember that it is about our most important resource - our people and their welfare. The debate should be about the guaranteeing of jobs, financial security, and the future. The arrival of the IMF and the ECB has caused serious disillusionment among the Irish people who are now very angry, deeply resentful and distrustful of government decision makers. Many believe it is a national travesty that the economy of this state has been pawned to appease foreign banks; and that the country’s wealth is to be paid as financial compensation to the European economic elite. That’s not the Ireland that the leaders of 1916 fought for; it is not the Ireland that the volunteers of Kilmichael fought for; and it is not the Ireland that generations of modern day republicans have struggled to achieve. It is not our people who should be losing their jobs and paying the price. Let the golden circle, the fat cats and gombeenmen take the pain instead. What has happened in this state is anathema to republicanism. It is a corruption of the Proclamation and Democratic Programme. Sinn Fein believes this crisis can be stabilised and that we can get back to recovery and growth. We need to focus upon job creation and job creation programmes. These can be based upon raising 4 billion in tax revenue, efficiencies and wealth taxes, and a 7 billion euro stimulus package funded through the National Pension Reserve Fund over the next 3-5 years. Banking practices must in future be subjected to proper regulation and a state bank be established. That is a solution which puts people first. Donegal south west represents the beginning of that change. There the people have spoken and ever increasingly the Irish people are demanding the right to have their say. Before anything else happens they must immediately be given that opportunity. The Irish republic is not the property of the political establishment. It belongs to the people of Ireland, and I have faith in the people of Ireland. Genuine republican leadership and a coherent political strategy are now needed. That is what Sinn Fein is about. We are playing our part, in standing up and delivering. That is why Gerry Adams gave up a safe seat in West Belfast to run in County Louth in the next General Election. That’s why the people of Donegal South West elected Pearse Doherty as their Sinn Fein TD on Friday. As citizens we need to be as bold and audacious today in asserting our right to equality and decent standards of living, as this Rebel county were during the Tan war. On Saturday next, 4 December, Sinn Fein invites you all to demonstrate with our Party in Dublin against this Government’s budget and its failed economic and political policies. Fundamental change is needed in Irish society; not more of the same, or “old wine in new bottles”. We are now back to Connolly and the re-conquest of Ireland’s economic sovereignty and political democracy for the benefit of our people. Let us create the momentum to unite our country, and together build a national, sovereign and democratic republic. An Irish republic of the people, by the people, for the people. Yes, there is indeed a better way. And it will be found in a national republic which preserves and defends its sovereignty, and cherishes all the children and citizens of the nation equally. Ar aghaidh linn le cheile i dtreo na Poblachta.